B2B marketers need a secret weapon when it comes to campaign management and data quality, especially given the number of campaigns and marketing avenues that they have to work through. 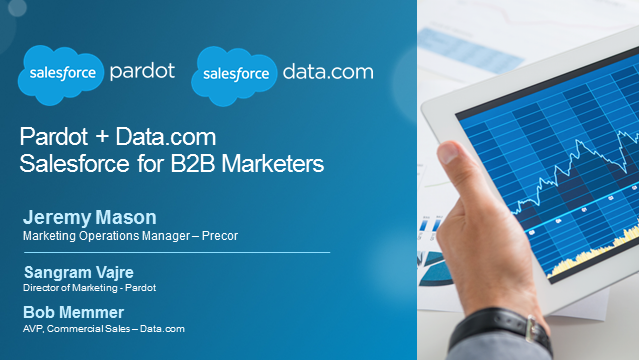 Salesforce.com provides a solution: Pardot B2B Marketing Automation and Data.com. Enter, your technology solution. With Pardot, B2B Marketing Automation by Salesforce, marketing and sales teams can maximize campaign efforts, boost productivity, and shorten sales cycles — yielding consequential benefits both marketing and sales teams. We’ll also be joined by a Pardot client, who will share how marketing automation has transformed the way that they market and sell! Building lasting relationships with customers requires consistent, personalized, and relevant engagement. Pardot is thrilled to unleash Engagement Studio, the new solution that allows you to design, test, and measure engagement programs that adapt to buyer behavior using more than 100 triggers. - Identify target buyers and key stakeholders, and more. JEREMY MILLER - Keynote speaker and bestselling author of "Sticky Branding"
Do customers choose your brand first? This question is the essence of branding. Branding isn’t about logos, taglines, websites, or colors. Branding is about the bond you form with your customers — a bond where they choose you first. When you have a brand that works, your customers think of you first, and they come back again and again. You form real relationships with your audience. But here’s the challenge. The pace of marketing is changing rapidly, and your brand must evolve to keep up. In this talk, Jeremy Miller will show you how to transform your marketing to create a first choice advantage. His blend of humor, stories, and actionable ideas will inspire you to innovate and grow your brand. Financial Services marketing is about more than brand awareness. It’s about staying in front of investors even when they aren’t ready to invest. It’s about ensuring your brokers have the latest information about your products and knowing when and how to best communicate with them. It’s about ensuring wealth advisors have the best available tools to make them want to come to your firm - and help them to effectively grow assets under management. There is a new generation of capabilities creating prospect and customer engagement at scale that is personalized, content-driven and relevant. Join Salesforce and Pardot for a look at how financial services firms are driving growth in new and creative ways leveraging the power of integrated marketing and sales. Also, hear how implementing Pardot has transformed the way a Pardot client does business! Given the ever-changing (and ever-expanding) amount of channels that we as B2B marketers continue to market through, consistent questions surface when planning that next campaign effort - even for veteran marketers. Which direction first, how many channels should we promote through? And the list continues. - Time-saving tips when you are under pressure to deliver - and deliver fast! Purpose, value, trust - these words that are the foundation of the new world of B2B marketing. Incredibly telling, they provide critical clues to the 2016 buyer. Your buyer’s expectations, discovery paths, and mindset are all quite different from just a few years ago. But, how and why are they different? Fair Warning: Be prepared to be inspired! Have you ever wondered how we tackle SEO and SEM here at Salesforce Pardot? Hear from expert trainers, Katie Blair and Bob Dinsmore - Salesforce Online Marketing, on how we approach SEO and SEM to drive leads and pipeline. Our trainers will also be joined by Christina Rohde, Online Sales Account Manager at Google, who will share her expert perspective on goal-crushing, gold-medal-earning, ninja-warrior-level SEM promotional plan ideas for 2016. LET’S GET READY TO… REPORT! Every marketer wants (and needs) to know how effective marketing campaigns are. Have you ever wondered how we know where to invest our marketing dollars here at Salesforce Pardot? Our own reporting drill sergeant, Isaac Payne, will bring the pain (just kidding! ), revealing reporting plays we use here at Pardot to make more informed marketing decisions. To help you really refine your reporting strategy, we’re also bringing in a special guest sensei with black belt reporting know-how to inspire you to go the extra mile in 2016. They may not be able to catch a fly with chopsticks, but they can run KPIs with their eyes closed. And now you can, too. ATTENTION B2B MARKETERS - grab your red pen, start warming up your brainstorming muscles, don’t forget your thesaurus, it’s time for a content marketing makeover! You’ve got to crank things up a notch in 2016, and our content coaches are here to help you kick things off. We’ll pull back the curtain on the Salesforce Pardot Marketing team, and share how we approach content marketing to drive more leads and enable our sales team. Plus, we’ll be joined by Seth Lieberman, CEO of SnapApp, who will inspire and motivate you with even more tactical techniques for the ULTIMATE REVENUE-DRIVING CONTENT GAMEPLAN! Regardless of your company size or industry, it’s critical that your business stays ahead of the competition. That’s why it’s more important than ever for sales teams to arm themselves with the tools they need to reach the right prospects at the right time. And even more than that, with the right message.